To my surprise and delight, I discovered that crossing twelve time zones while confined to a small space for twenty hours is not as awful as I thought it might be. I’m not sure whether it was yoga (“breathe into it”) or my Bose noise canceling headset and iPod, but something got me to my happy state of mind and kept me there! After flying over the Arctic, we landed at Incheon in South Korea. It is a gorgeous new airport built right on the water. With less than an hour to change planes, we quickly dashed from gate to gate, discovering just in time that our departure gate was one floor higher than our arrival gate. On our return, we’ll be spending five hours there, so our transit will be far more leisurely. This was our flight path for the first 14 hours of our journey. We were literally on top of the world. Our plane landed an hour late, because the wings had to be de-iced. We went from a snow storm in Korea to 82 degree weather in Bangkok–at 11 PM, no less. Yikes! What will it be like in the afternoon? By the time we got through immigration, collected our luggage and exited customs, it was midnight. We were a little concerned that our ride might have given up on us when we didn’t see anyone holding a sign with our name on it. The Thais sure make it easy for tourists–staffing a help desk at the official meeting place (door 3 in the arrival hall), calling the hotel to make sure our ride was on his way to fetch us. The airport is on the outskirts of Bangkok. With no traffic, the hotel was about 40 minutes away. We finally made it to bed a little after 1 AM Bangkok time, which was 1 PM our biological time, 24 hours after we took off from JFK. 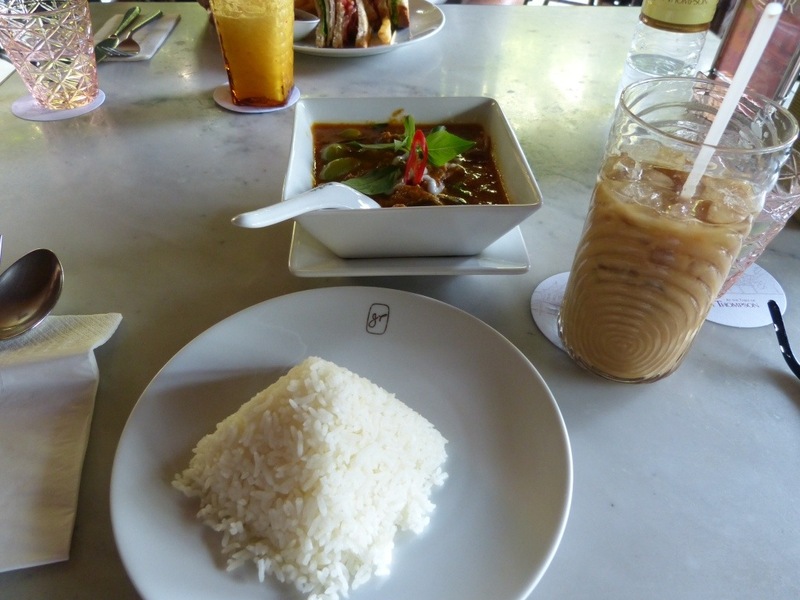 Because of jet lag and the heat, we decided to take it really easy on our first day in Bangkok. Our big accomplishments were locating the SkyTrain station two blocks from our hotel, buying train tickets from the machine, touring the Jim Thompson House and having dinner at a restaurant on the river. The Jim Thompson house is actually six separate teak buildings that he brought to the site in 1959 and combined. The buildings are at least two hundred years old and are filled with antique Buddhas, beautiful silk paintings and porcelains. Some of the buildings were moved from the ancient capital of Ayutthaya. 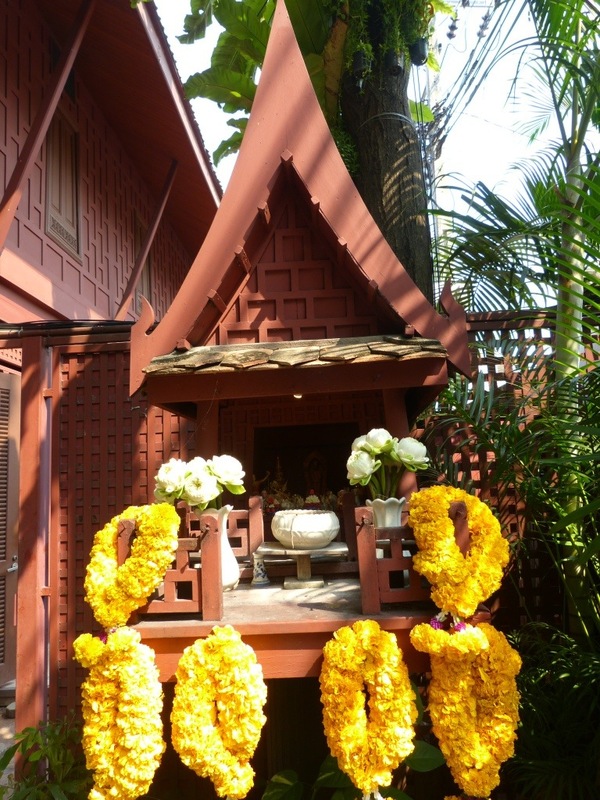 At the entrance to the house and museum complex, I saw my first Thai spirit house. Spirit houses are very common in Thailand and Cambodia. They are usually miniatures of the actual dwelling, and filled with offerings to the gods. Can you see the little figures inside? World War ll. During the war, he served in Thailand, as an officer with the OSS, the predecessor of the CIA. He fell in love with the country, moving to Thailand at the end of WWII. He recognized the beauty and craftsmanship of handwoven silk, and did much to promote and popularize the industry. In 1967, he went for a walk in the jungle of Malaysia and disappeared. No one has been able to determine what happened to him, although his astrology chart indicated that things would not go well for him after he turned 61, his age at his disappearance. 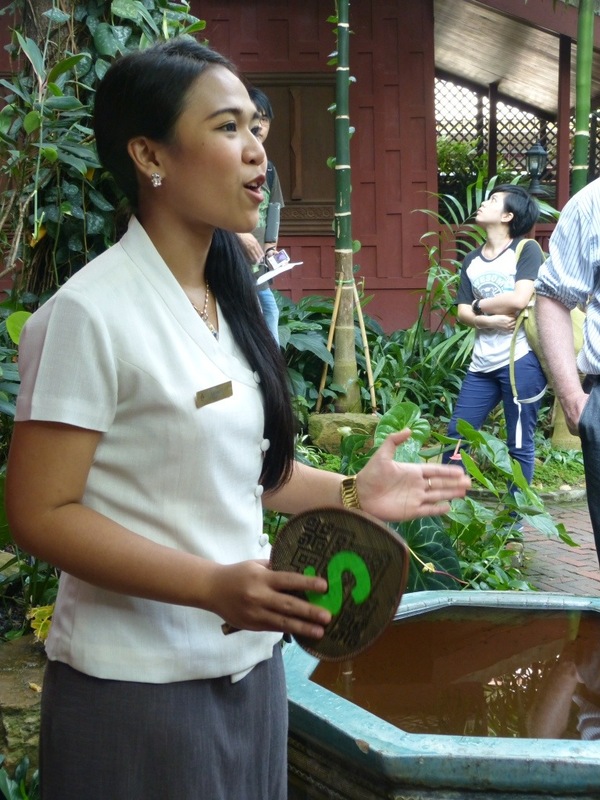 This beautiful young girl was our tour guide. Astrological chart in his study and challenging us to find the children’s chamber pots in the guest bedrooms. Mike correctly identified the porcelain frog as the girl’s chamber pot, but no one spotted the boy’s–a cat, whose head came off. We weren’t allowed to take photos in the house. Too bad–those were quite cute. After the tour, we had lunch at the museum restaurant. I was uncharacteristically adventurous, going for the the spicy curry with grapes, duck and pineapple. The gift shop was definitely worth a visit. They sold the cutest clothes for children. I may not be a grandmother, but I’m determined to be a great aunt, in every sense of the word…so there are some surprises for the little people in my life. Glad to see you are a food photographer! I can drool along with you! Have a great time, pictures look great. Little Kate will love her (GAS)Great-Aunt Shelley!!! Wait–that name was already claimed…by YOU! So, you are on the road again. We visited Jim Thompson’s house in 1998. I found it fascinating too. Can’t wait to hear all about it. Marion, so good to hear from you. As usual, the adventures are way ahead of my blogging! Grand palace is next. As usual you are very informative on all your trips. I may not be able to be there, but you help me learn new things all the time. Have a great time, the two of you!